To this category belong individual issues and complete holdings of newspapers from Namibia and other southern African countries. 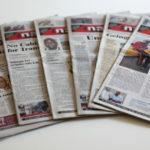 We have ongoing subscriptions to the Namibian daily newspapers The Namibian and the Allgemeine Zeitung as well as the weekly paper the Namibian Economist. As it is not always possible to obtain every issue of a newspaper, users are advised to check the information in the field holdings to verify availability of the issue they seek. Our newspaper collection, together with the journals, are the only BAB collections included in the catalogue of the university library.